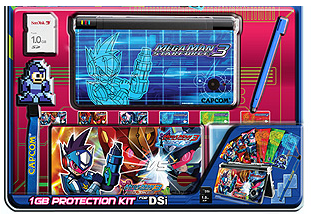 Rockman Corner: Mega Man Star Force 3 "Limited Edition"
What a waste of money. But cool all the same. I was looking for the DSLite one. Not a waste of money to me. If I knew about this earlier, I'd have waited to reserve Black Ace, but I guess I did so too early really. whats the difference between these and the one that will be available at gamestop? Presumably, GameStop will carry the kit by itself. Capcom is bundling the kit with MMSF3.